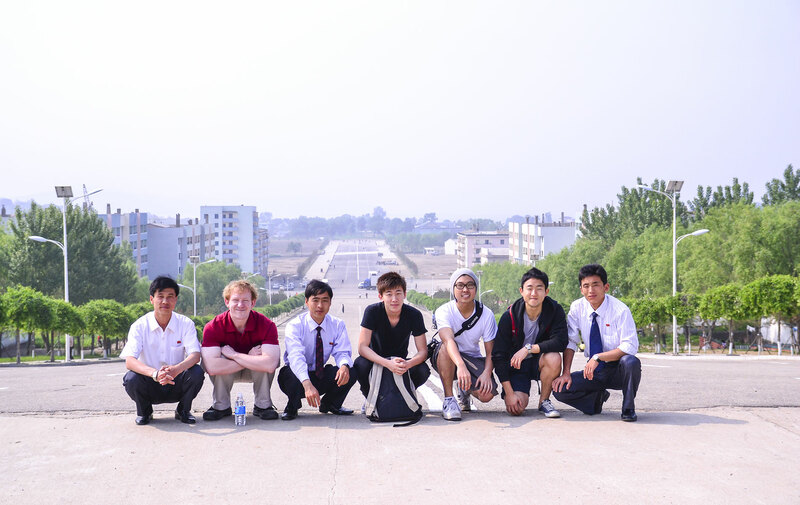 Every year, Krahun organizes and hosts a select number of exclusive tours offering guests extraordinary volunteer and cultural opportunities in the DPRK. 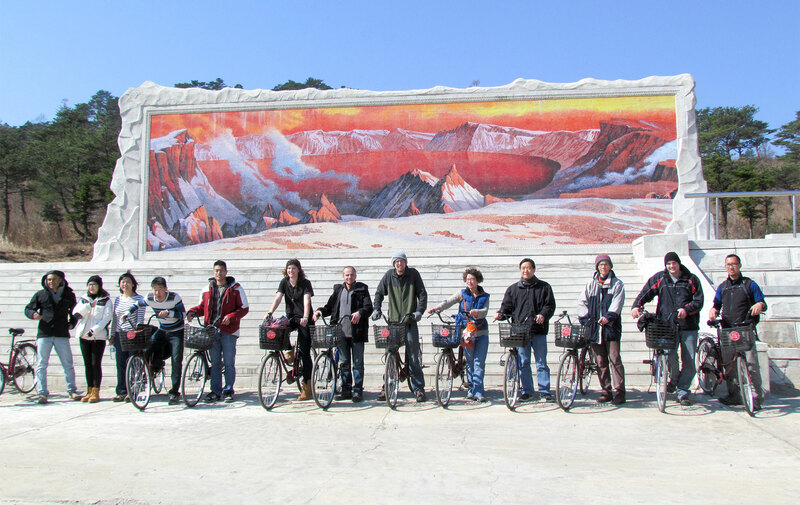 These tours are the result of close coordination and cooperation with the local DPRK tourism bureau, and allow guests to experience the DPRK in a truly unique fashion. Each tour is available at specific times during the year as listed in more detail below. Please contact us for more information on possible dates and itineraries. Independent tours are perfect for those who wish to travel in a private, set group, whether small or large, with maximum flexibility regarding dates and itinerary. You set the tour dates to match your schedule and we can work with you to customize your itinerary. Want to explore more regions of the DPRK such as Chongjin and Pyongyang? Want to spend time on our farm and help with daily farm work or a construction project? Independent Tours are the way to go. 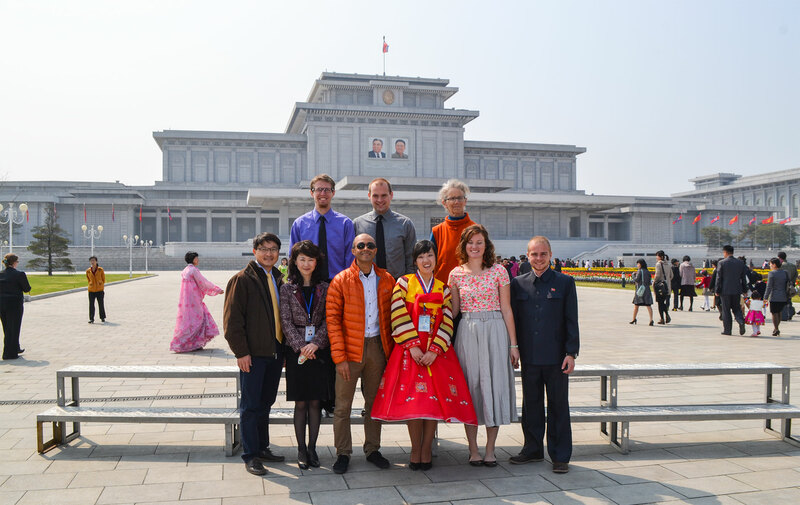 Krahun is excited to invite visitors to the DPRK for a special service opportunity! 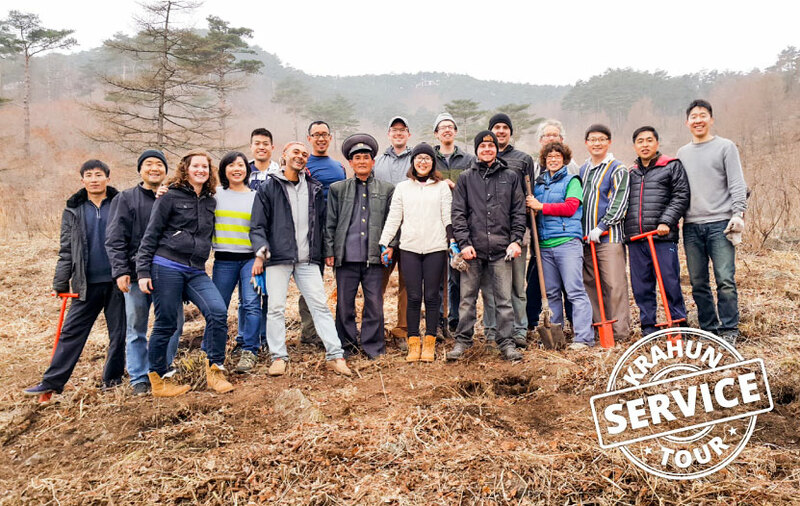 In Spring 2014, Krahun organized the first ever tree planting service project in North Korea, offering visitors a rare opportunity to plant trees in the northeastern region of North Korea. We’re proud to say that our visitors planted 4000 trees over several days and thousands more since then! Learn from and work alongside local DPRK Forestry officials to invest in the future of the country. Krahun offers a special three part Rice Farming Service Series allowing visitors to play a special and unprecedented role in the DPRK! Come join any part of the series. For Part 1 guests are invited to plant rice in the country! Every year, DPRK communities mobilize all around the country to plant rice, one of the most critical food crops in this nation, and now you can join! 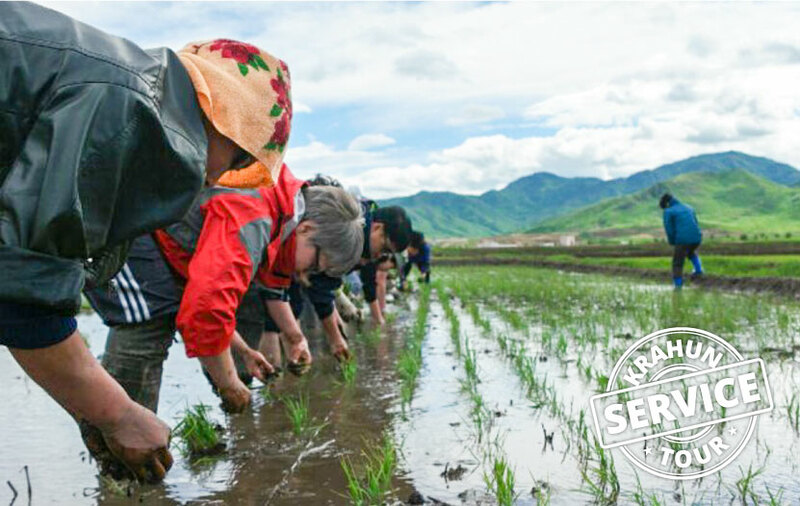 We’ve worked closely with the local DPRK tourism agency to allow guests to come to North Korea and take part in the country’s rice planting push. 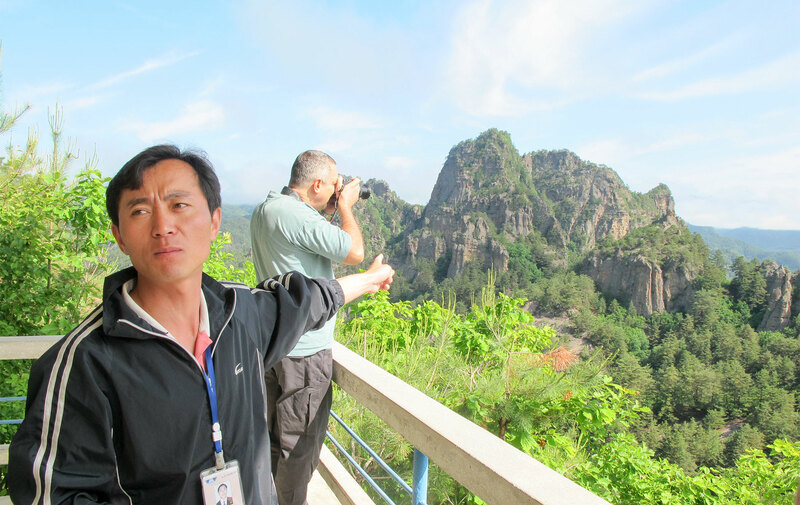 As the only tour company actually based in North Korea, no other company has closer relationships with the local tourism agency, making tours like this possible. 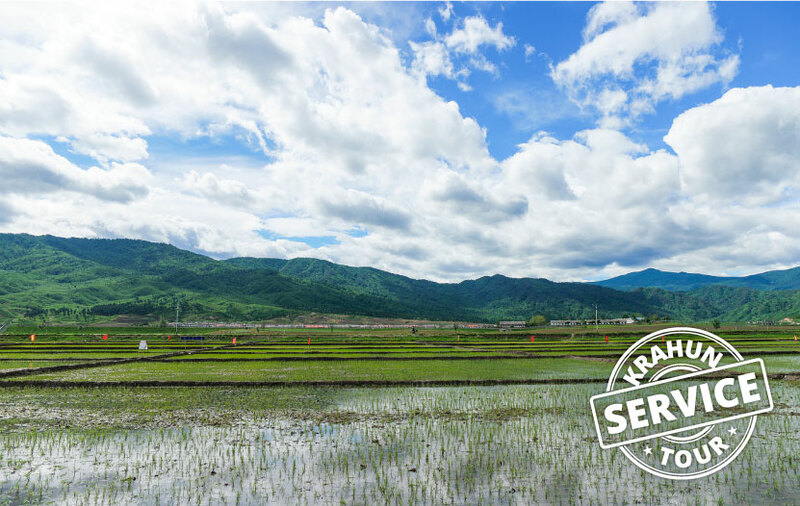 After Part 1 of Krahun’s new Rice Farming Service Series, Krahun is thrilled to invite guests for Part 2: helping North Koreans with rice cultivation! 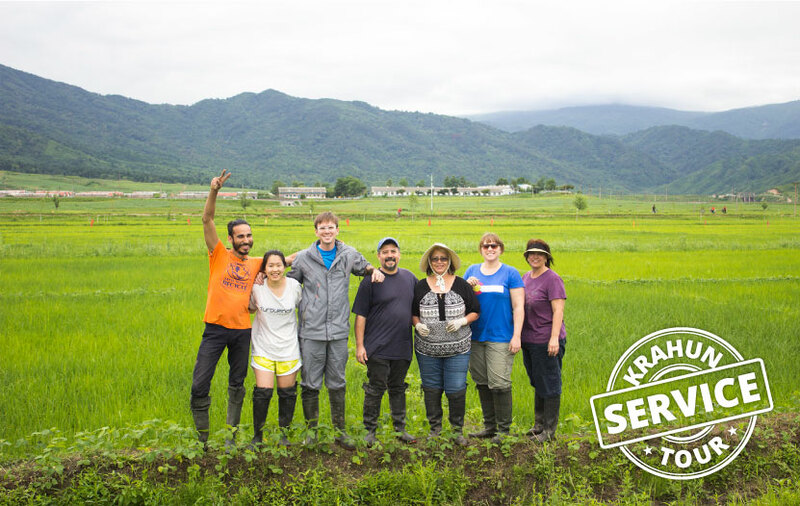 This unprecedented service opportunity will brings guests to North Korea to take part in the critical work of managing and cultivating rice planted by North Koreans earlier in the year. Local North Koreans will lead guests in hand weeding and other activities to maintain rice crop health and to make sure rice plants get the proper nutrients. Come join one of our most popular tours – our classic Rason tour – offering guests a great opportunity to experience North Korea in special ways not available elsewhere. As the home of our headquarters, guests get a chance to visit us as we play host. In addition to a snapshot of Rason and North Korea, Krahun is also offering an add-on for guests to visit the China-side of Mount Paekdu, known as Mt. Changbai, the mountain revered by Koreans on the entire peninsula and central to Korean culture and long history. Krahun welcomes guests to the final part of its new and exclusive Rice Farming Service Series: harvesting rice! After planting rice in the spring and cultivating the rice throughout the summer, North Koreans across the country will finally harvest the fruits of their hard work and you can help! North Koreans will collect rice crops, cutting, stacking and handling them, using harvesting techniques to maximize grain yield. Krahun invites guests to come make kimchi in North Korea alongside locals! 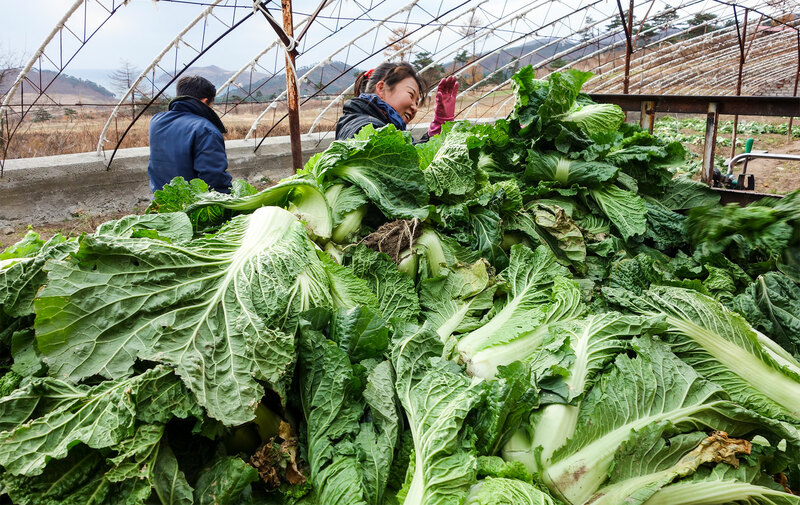 Known as gimjang (김장), North Koreans across the country take part in this age-old tradition to make kimchi for the long winter. Internationally recognized by UNESCO, the tradition of making kimchi is a significant cultural event in the country. Guests will not only get to make and eat fresh kimchi, they’ll also get to experience the special camaraderie of working alongside local North Koreans. Rason offers visitors a wonderful opportunity to experience North Korea in unique ways unavailable elsewhere in the country, and Krahun is organizing its most popular tour for anyone to join. As a vibrant city of close to 200,000 people with mountains on one side and the ocean on the other, a trip to Rason allows guests to experience authentic, everyday North Korean life in ways unique only to Rason. Only in Rason can guests visit the main market and openly haggle with vendors while shoulder to shoulder with a sea of locals; no other city in North Korea offers the same opportunity. The market is large and bustling with activity, giving guests an eye-opening window into North Korean life. Guests can also visit a number of schools to get up close and personal with students, whether it be the foreign language middle school where guests can speak English with students, or a local sports academy where guests can play soccer with students. For those who would like to go deeper into North Korea and compare Rason to other areas of North Hamgyong Province, this tour takes visitors 100km south to Chongjin, the capital of North Hamgyong Province and the country’s third largest city. Our Rason-Chongjin Tours allow guests to visit a city that only recently opened to Western tourists for the first time and to truly experience a part of North Korea not experienced by many, even compared to North Korean tourism in general. One of the main attractions of Chongjin, and of North Korea more broadly, is Mount Chilbo, one of the most beautiful mountain ranges on the entire peninsula. Named the “Seven Treasures Mountain”, Mount Chilbo contains breathtaking rock formations and was placed on the UNESCO World Heritage Centre’s tentative list in 2000. For the ultimate DPRK tour experience, Krahun offers guests a unique opportunity to see and experience a larger swath of North Korea, starting out in Rason and traveling to Pyongyang, the capital – a trip through the entire country! As North Korea’s largest city and capital, Pyongyang offers guests a wide range of activities and the chance to visit even more cities outside of Pyongyang such as Wonsan, Hamhung, Kaesong, Sariwon, and many more. Not only will guests visit multiple cities in North Korea, but they will also experience traveling domestically by air, taking a short 50 minute flight from Orang airport, located outside of Chongjin, to Pyongyang – a truly special and unique experience. For those looking to connect with this country and its people in one of the most authentic ways possible, we invite you to spend time on our farm! 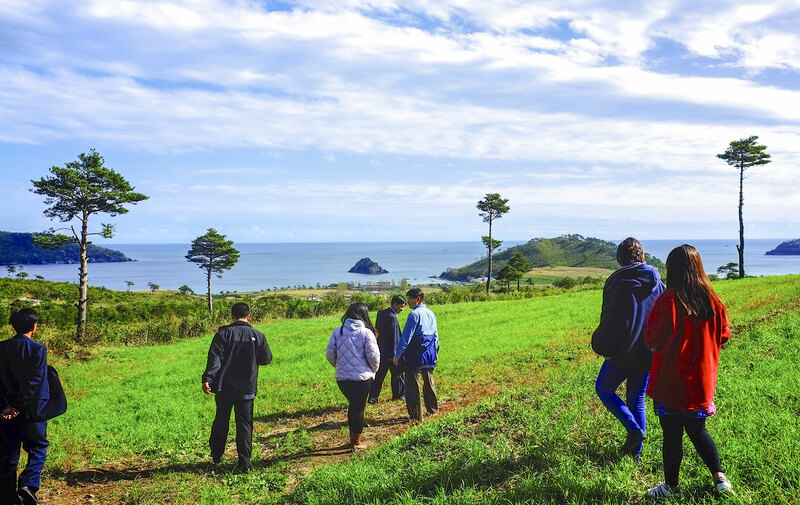 Come explore and experience Krahun Farm, nestled in the DPRK mountainside with beautiful panoramic views overlooking the country’s eastern shores. Guests can participate in daily farm life and take part in the daily rhythm of our farm in a myriad of ways: collect organic eggs from our chickens, feed our goats, chickens, or rabbits, tend to our barn, work in our greenhouse, help out with a construction project, or help our local North Korean workers in our fields with various crops. And with our staff of locals maintaining the farm, guests can work hand in hand and help them directly with their daily work, providing an incredible opportunity to interact and work with locals in a truly authentic and unprecedented way.